The purpose of this comedy and music event is to raise money for Ms. 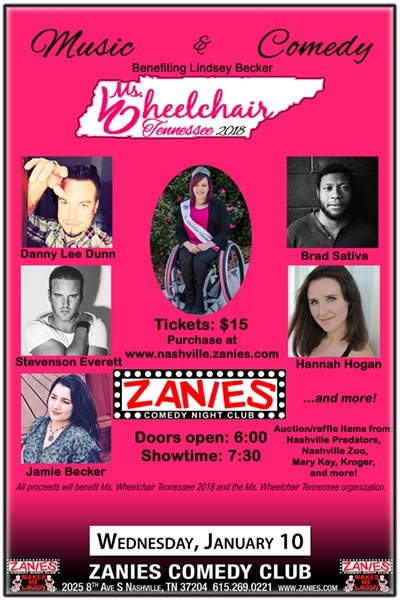 Wheelchair Tennessee 2018 - Lindsey Becker’s travel and personal expenses during her reign, in addition to helping support her on the national level at the Ms. Wheelchair America 2019 competition. Additional funds raised beyond her needs will go to support the Ms. Wheelchair Tennessee organization. Ms. Wheelchair is an ambassador of the State of Tennessee. She travels across her state speaking with other representatives and members of the community about the issues and triumphs of individuals with disabilities. While contestants are showcased in a pageant format, Ms. Wheelchair Tennessee is not a contest of beauty. It is a competition, started in 1996, to select the most accomplished and articulate spokesperson for people with disabilities across the State of Tennessee. There will also be a silent auction/raffle items from: Nashville Predators, Nashville Zoo, Mary Kay, Twin Peaks, Kroger ...and more to come!